If you aren’t selling, you aren’t working. If you aren’t working, you aren’t able to pay your staff, pay the bills and keep the business running. As a lawn maintenance business, selling your services is just as important as knowing how to mow a lawn properly. For new businesses just starting out, there is no way around having to sell. And as a well established company with a large number of accounts, you will still need to sustain your book of business and sell to new customers. Finding prospects that are a great fit for your business can be an arduous and complex process. Sales isn’t always a linear, step by step process. A prospect can move forward, backward, off track and back on track again. There are times when someone will search out your business, know exactly what they need and you may be able to have sold that prospect within minutes. On the other hand, you might wind up with people dragging their feet and could possibly take them months to come to a decision. Creating and managing a successful sales process is similar to piecing together a hotrod. It might take a while to even get it up and running. But after spending time, putting the right parts into place, you’ll go from rolling it out of the garage, to cruising, to flying past competition. 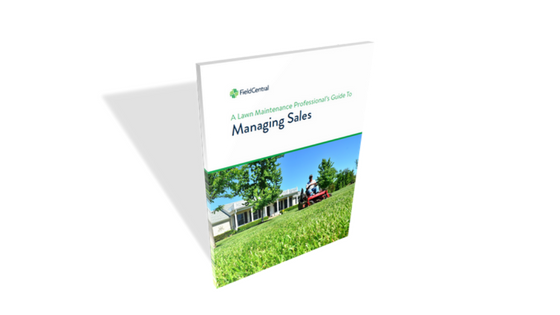 In the free eBook, A Lawn Maintenance Professional's Guide To Managing Sales, we cover how to prospect new leads and how technology can help you manage and monitor a sales pipeline. No matter how large or small of an organization you're operating, having a well organized and documented sales process will create more and more opportunities for sustained sales. One of the biggest components of being successful in sales in the lawn maintenance industry is to have a great estimating process. A Lawn Maintenance Professional's Guide To Managing Sales contains a full chapter on how to accurately estimate your jobs. Accurately estimating can be the difference between pricing your services for a profit or a loss. The guide is available to download for free, just click the link below.